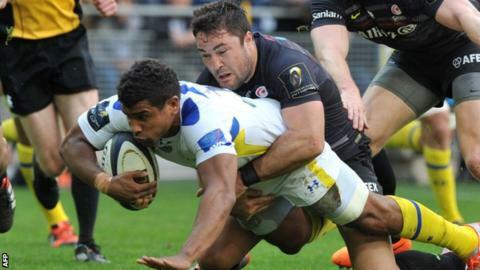 Clermont Auvergne avenged their thumping defeat by Saracens in last year's semi-finals to reach the final of the European Rugby Champions Cup. A nip and tuck first half saw Saracens lead 6-3 at the break thanks to a drop-goal and penalty from Charlie Hodgson. Brock James set up Wesley Fofana for the only try of the game soon after the restart and converted to add to his first-half penalty. Owen Farrell cut the gap to a point but a late James penalty saw Clermont home. Saracens went into the game determined to reach a second straight European Cup final - they lost 23-6 to Toulon in the last-ever Heineken Cup final 11 months ago. But despite putting their bodies on the line for the full 80 minutes, with England number eight Billy Vunipola outstanding both in defence and attack, they ultimately lacked the firepower to put away an improved Clermont side. When the two sides met in the last four in 2014, Saracens produced an astonishing performance to hand the French side a record 46-6 defeat. With that humiliation spurring them on and the vast majority of a 41,500 crowd firmly behind them at St Etienne football club's Stade Geoffroy-Guichard, Clermont ensured there would be no repeat as they reached their second final in three years. They will now play either two-time defending champions Toulon - who beat them 16-15 against the run of play two years ago - or three-time former winners Leinster in the first final of the revamped European Champions Cup, the successor to the Heineken Cup. Veteran former England fly-half Hodgson's drop-goal gave Saracens an early lead but when Clermont took control midway through the opening 40, it looked as though they would steadily pull clear. They should have had a try when Chris Ashton prevented Napolioni Nalaga from scoring in the corner with a last-ditch tackle - the winger failed to use his arms and most observers thought it should have been a penalty try, but the television match official awarded a 22 drop-out to Saracens. Dogged Saracens defence and wayward kicking from Clermont's Australian fly-half James - Hodgson also missed a couple of long-range penalties for Saracens - kept the Londoners in it and a penalty apiece by the two 10s gave the English side a slender lead at half-time. Clermont lost their rhythm towards the end of the first half but soon after the restart a perfect display of power and then class created the decisive score. Number eight Damien Chouly's drive got them on the front foot inside the Saracens 22 and when the ball came out to the backs, James found space with a chip of the most precise calibration and France centre Fofana beat the defenders to the ball before diving theatrically over to score. James converted and although Saracens got back to within a point through England fly-half Farrell, who returned to action off the bench after three months out injured, they struggled to threaten Clermont in the last quarter. Heroic defence, especially at the breakdown, prevented Clermont from crossing the line again but a second James penalty gave the French side a four-point lead which was never threatened despite a desperate late Saracens attack. "I thought the effort and many, many aspects of the performance were phenomenal. "We made Clermont play a game that they didn't really want to play. "The game was on a knife-edge all the way through. We made maybe a few too many errors at crucial times, but in terms of the big things that we judge ourselves on, we were magnificent." Clermont Auvergne: Abendanon; Nakaitaci, Davies, Fofana, Nalaga; James, Radosavljevic; Debaty, Kayser, Zirakashvili, Cudmore, Vahaamahina, Bonnaire, Bardy, Chouly. Replacements: Rougerie for Nalaga (74), Parra for Radosavljevic (54), Chaume for Debaty (73), Ulugia for Kayser (66), Lapandry for Bardy (55). Saracens: Goode; Ashton, Bosch, Barritt, Wyles; Hodgson, Wigglesworth; M Vunipola, George, Du Plessis, Kruis, J Hamilton, Itoje, Burger, B Vunipola. Replacements: Strettle for Wyles (73), Farrell for Hodgson (57), De Kock for Wigglesworth (68), Gill for M Vunipola (73), Brits for George (50), Johnston for Du Plessis (50), Brown for Burger (74).